There is a new excitement among scientists about a drug that could flush out HIV from the blood system, thereby providing hope of a cure for millions of carriers of the virus across the world. At the ongoing 20th international conference on AIDS 2014 in Melbourne, Australia, experts reported that early results of the research tried on six people living with HIV are very “exciting” and are “a promising start”. Those living with HIV are currently placed on anti-retroviral drugs which can drive the virus to insignificant or undetectable levels in the bloodstream. But while this has led to normal life expectancy in carriers and has even seen HIV-positive persons have children that are free of the virus, the anti-retroviral drugs are not a cure because the virus can still hide in someone’s DNA and be dormant for decades. It can incorporate its DNA into someone’s and lie beyond the reach of drugs and the immune system. This is known as “HIV reservoir”, making the virus to be regarded as incurable because when the carrier stops using drugs, the virus will come out of the reservoir and continue to attack the body. However, the recent research shows that low-dose chemotherapy can awaken the virus and flush it out of the system ─ meaning HIV may now be curable as it will no longer have a hiding place in the body. The result of this research is considered a promising start, although experts are cautious to announce an outright cure because of certain obstacles. Scientists have been concentrating efforts on developing a drug that would flush the virus out of the system completely and make HIV curable. A team at Aarhaus University in Demark performed their experiment by using a chemotherapy drug, romidepsin, which is normally used to treat lymphoma. The trial involved six people living with HIV who have undetectable levels of the virus. Each received a reduced dose of romidepsin once a week for three weeks and viral levels in the blood of five of them jumped noticeably ─ making it possible to clear the “reservoir” of the virus and then attack it with anti-retroviral drugs. In an interview with the BBC, one of the scientists, Dr Ole Sogaard, said: “Every step forward is always exciting, and I think this is quite important.” “We’ve shown it is possible to kick the virus out of the cells, the next step is to actually kill the cells. “The trial now moves into a new phase which combines the romidepsin with something to enhance the immune system and in our case this is an HIV vaccine,” he said. There are side-effects, but these are those normally associated with chemotherapy, fatigue being noticeable. Despite the exciting early results, there are many rivers to cross. For instance, the researchers are not yet sure what proportion of cells hiding HIV are being activated by romidepsin. Yet another area of inquiry is which reservoirs are being successfully targeted because although HIV can hide in immune cells in the blood, there are bigger reservoirs in the gut and central nervous systems. It is not clear if they can be activated by the blood-based chemotherapy. Romidepsin works by “relaxing” tight coiled up bundles of DNA. 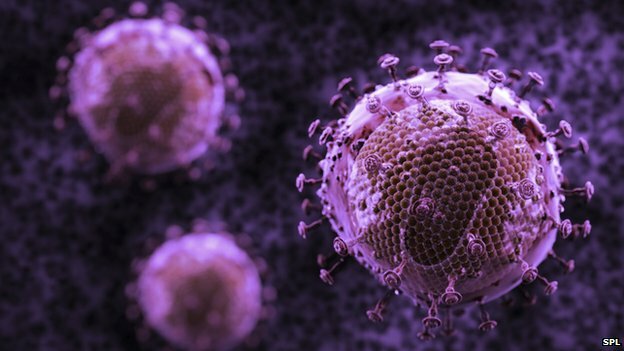 This exposes the hidden HIV genetic code and leads to the production of new viruses.